ARCADE is an internet connected software plugin that requires an active subscription. In order to subscribe, please visit output.com/arcade. When subscribing you will be asked to login or create an account, enter your billing details, and enter your credit card details. Your credit card can be updated at any time and won’t be charged until the free trial has expired. When subscribing to ARCADE, you will enter into a free trial period in which you will have access to all of the features and content of the product without limitations. Once the free trial has expired, you will be charged the advertised monthly subscription fee, which will continue every month until the subscription is cancelled. In order to cancel your subscription, please go to the subscriptions tab at output.com/account. When you sign up for an ARCADE subscription, you will be provided download links for both the Mac and Windows installers directly from the web browser. You do not need to download ARCADE via Output Hub. After downloading the installers, follow the on-screen instructions when prompted. Download links are also included in your order confirmation email and accessible via the ‘My Account’ section of our website. The ARCADE installer will provide you with all of the plugin files as well as one Kit per Line, so you can start playing with Kits and Loops immediately without the need to download anything. 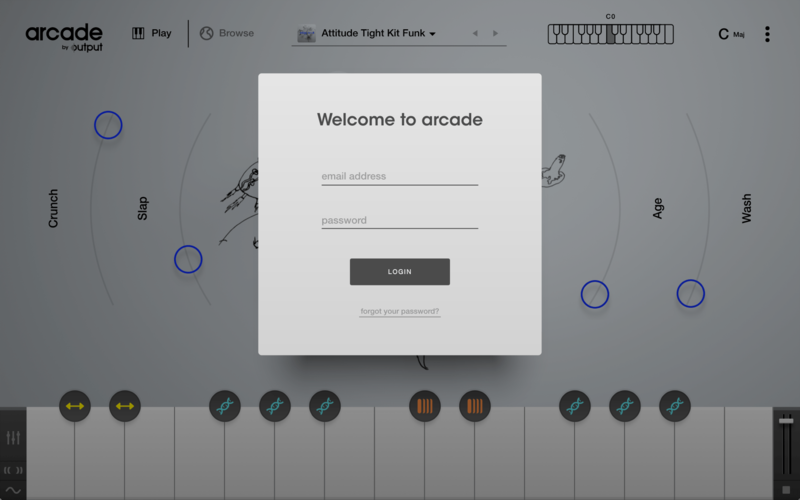 Note: Unlike our previous Kontakt libraries, ARCADE is an instrument plugin unto itself and does not work within Kontakt. As a result ARCADE does not need to be activated in Native Access. All you need is a compatible Digital Audio Workstation (DAW), an Output account, and an internet connection to login for the first time. ARCADE requires an internet connection to get started. ARCADE is a plug-in that can be loaded in your Digital Audio Workstation (DAW – Pro Tools, Logic, Live, Garageband, Etc.). It’s also an application where you access it from the Applications location on your computer. To load ARCADE, first launch your DAW and create a new Instrument (or MIDI) track. Next, look for ARCADE (under Manufacturer::Output) in your list of virtual instruments and load it onto the track. Once you’ve loaded the ARCADE plugin, a window will appear asking you to enter your Output account login credentials. Once you’ve entered your Output account email address and password, click Login. If you’ve forgotten your password click the ‘Forgot your password?’ button located under theLogin button. You can also click here to reset your Output account password. You’re allowed to log into ARCADE on a total of 4 computers. Between those 4 machines, ARCADE can only be in use on one machine at a time. Important: ARCADE is designed to be used by one Output account per computer, so you cannot log out of your account and log into ARCADE using another account. If, for some reason, you need to log into a different account, please contact Output support and they will help facilitate this. ARCADE will work well with the following DAWs: Ableton Live, Logic Pro, Pro Tools, Cubase, Studio One, FL Studio, Digital Performer, Reason, Maschine, Bitwig, Reaper. If you don’t see your DAW on this list, that doesn’t mean that ARCADE is not compatible with it, just that it hasn’t been thoroughly tested. If you do have any difficulty with ARCADE in your DAW just reach out to our support team and we’ll be glad to assist.